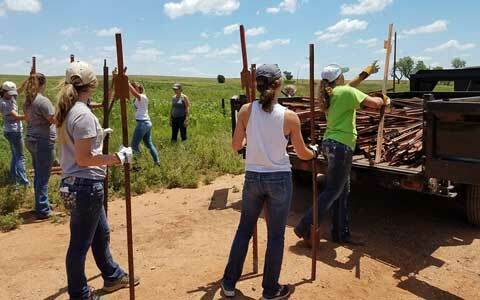 MdCV FFA members help cleanup after a wildfire, loading fire damaged posts onto a trailer. The Marais des Cygnes Valley FFA officers worked on their leadership skills, organized the year of events, and assisted a family affected by recent wildfires during their annual officer retreat held July 5-7, 2017. This year’s retreat began early Wednesday morning as officers Josey Weimer, Dalton Hook, Chloe Volkman, Kali Holt, Kathryn Vaught, Alaina Marsh, Brookelyn Janssen and Destiny Massey headed towards Wichita to tour Cargill Innovation Center, where they met with Kassie Curran, Cargill program director and past Kansas FFA officer, who spoke to the group about opportunities and the business at Cargill. This was followed by a tour of the facility. The officers then spent the afternoon visiting the Sedwick County Zoo enjoying the various zoo animals. Afterwards they headed to Greensburg, where they visited the changes in the city in the 10 years following a devastating tornado. That evening the officers sat down to look deep inside themselves to reflect on personal growth and team unity as well as the importance of being positive role models at the school. The next day, the officers headed to the Giles Ranch, located between Bucklin and Ashland, where the destructive wildfires destroyed thousands of acres, livestock, and the homes of the Giles daughters and their families. The MdCV FFA officers spent the next two days helping out by picking up fire damaged fence posts after crews that were rebuilding over 200 miles of fence on the ranch. Members also helped reorganize a storage container of donated items for distribution. There was not a doubt that the three important things to this cattle family was faith, family and agriculture, the FFA members agreed. The officers also spent time in the evenings planning and organizing the upcoming year of activities, which includes “Farmagedon” a 5K obstacle course event with proceeds being donated. The officers look forward to the school year and the opportunities and experiences it will bring. Information and photos thanks to Danny Rice, MdCV FFA adviser. 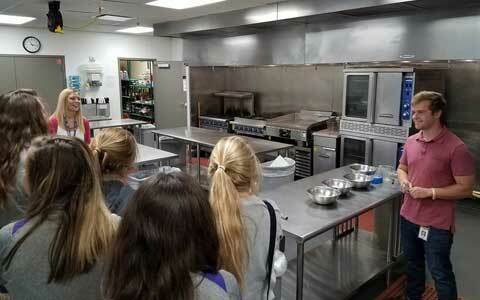 Officers tour the Cargill facility at Wichita and one of the research kitchens available for Cargill clients. 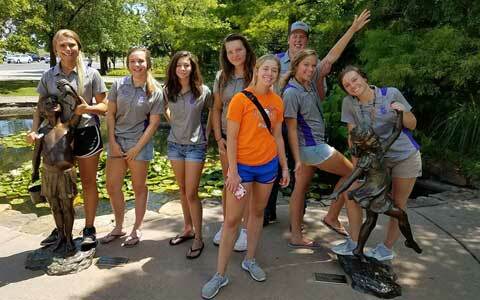 MdCV FFA at the Wichita Zoo, from left, Alaina Marsh, Destiny Massey, Kathryn Vaught, Brookelyn Janssen, Kali Holt, Dalton Hook, Josey Weimer and Chloe Volkman.